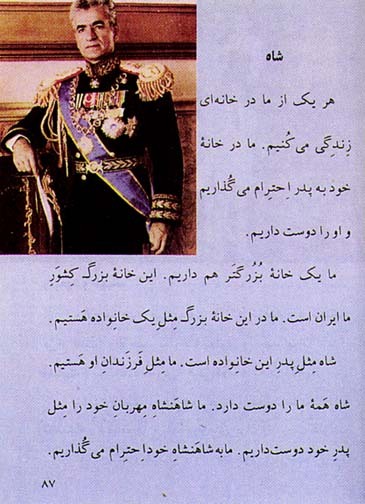 The first four pages of textbooks published for school children between ages of 6 and 12 (1965 up to the 1979 revolution) were dedicated to the ruling Pahlavi family, with photographs of the Shah, Empress Farah, Crown Prince Reza, and the Shah's sister Princess Ashraf. Next to the picture of the Shah, the text read: "Each of us lives at home. At home we love and respect our father. We also have a bigger house. This big house is our country Iran. In this big house we are like one family. The Shah is like the father of this large family and we are like his children. The Shah loves all of us. We love our kind Shah like our own father. We respect our Shah." From "Staging Revolution : The Art of Persuasion in the Islamic Republic of Iran"